I had a feeling this meme would come out again at some point. I've been in a mood lately--a mood where I just don't really want to do anything. An unmotivated mood? Something like that. There's been a lot on my mind lately, and the only things that are even remotely relaxing to me are either playing a mindless farming game, or reading. Well, I've also been doing some blog housekeeping--updating review links, challenge pages, and such. I've finished reading at least two or three books and haven't reviewed them. That's not a whole lot of reviews that I'm behind by, but it still feels like I'm behind. Because I'm about to finish one more book, and will probably end up putting off the review for a while. I've got one series review for Nora Roberts' In the Garden trilogy that I just need to finalize and post. And while I had planned to update my Halloween Bingo progress once a week... I kind of didn't feel like it this past Friday. So I'm just going to wait to do a more updated update this coming Friday. But it's not like a whole lot changed since my most recent update announcing my first Bingo. So not much has been missed. I've been spending random moments scrolling the Booklikes dashboard just to see how everyone else is doing, liking a few posts here and there, but that's about it. I don't think I'd call this a slump, per se... just a mood. I'll get over it soon. Meanwhile, I'm hoping to at least get the review for In the Garden trilogy posted. And hopefully a review for Just Past Midnight by Amanda Stevens, and for Protecting His Witch by Zoe Forward, written and posted. My reading plans for this week (and maybe even the next week), are fairly tentative. For sure I'd like to finish Hit and Run and The Decagon House Murders so that I can move onto Jaxson, get it read for the 'Werewolves' square--and to also knock off another book from my pre-owned TBR. I've decided that I will read The Turn of the Screw for the 'Classic Horror' square... and at the same time, I'm contemplating swapping out Neil Gaiman's Smoke and Mirrors for a different book for my 'Genre: Horror' square. I have a Poe collection that I found at a library sale, and am contemplating finding a short story from that collection. I'm just not feeling anything lengthy for Horror. Then again, Smoke and Mirrors is a collection of short stories... maybe I'll just listen to one of them and count it--then maybe come back to the rest of the short stories at another time. 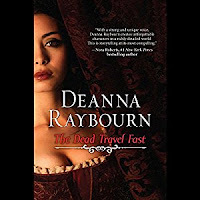 The only reasons I'm reading The Dead Travel Fast is because I like Deanna Raybourn... and I'm listening to it as an audio book, narrated by Charlotte Parry. As I've been in a mood (see intro), I'm not sure what I'm planning on doing for the blog these coming weeks. I'm going to try to keep up with my reviews and Halloween Bingo updates. I'm also needing to continue with my general blog housekeeping--some pages need updating, especially the challenge pages and my review list index. Meanwhile, however, I think I'm just going to take it easy until I can climb myself out of this mood. Good luck shifting your mood. I don't do scary books. The Halloween bingo wouldn't be my thing. Come see my week here. Happy reading! Thanks! I don't do scary books either--the hosts of Halloween Bingo have created custom cards where we get the chance to choose what squares we would like to read for, and my card leans more towards murder mysteries. I've managed to read romantic suspense and murder mysteries for almost all my squares, with a few paranormal books thrown in. lol I've cut out all the Horror squares I could manage, but still ended up with two of them. Two or three reviews is just enough to give yourself time to think about the books and how to review them. A few years ago I had a backlog of about 400 reviews which is how I ended up posting a review every day. Now I'm nearly to the point of running even with with what I read and what I review. Wow! 400 reviews backlog. That's certainly a lot of books. I think that would actually overwhelm me too much. I try to review each book as I finish them, but sometimes that just doesn't work out. I feel in a similar mood. By the end of the day when the kids are finally in bed, I just want to eat snacks and binge watch tv. Hopefully we both get out of our moods soon. Enjoy The Turn of the Screw--it's perfect for Halloween reading! Good luck to both of us getting out of our moods. =) I think sometimes you need a break, even from things you love to do. I love to blog and read, but blogging has just been the last thing on my mind lately. I'm still hesitating to read The Turn of the Screw--I'm just a wimp when it comes to Horror, but one of the reasons I participated in Halloween Bingo was to ease myself out of my comfort zone, at least for one or two books. I've heard a lot of good things about this novella, so I'm also kind of looking forward to it.